The consultative session was organised at a time when production from 20 operational wind power projects in Sindh has gone up to 1,037 megawatts, while by November 2018 another 200 MWs of clean energy would be added to the national grid through the completion of four more wind energy plants. Some 35 wind projects are in different stages of development in the province that could generate up to 2,500 MWs of more clean electricity. The Sindh government has held out the assurance that it would do its best to resolve in the shortest possible time key issues of investors working on wind energy projects in the province to prove that Pakistan is fully capable of utilising its massive potential to generate clean electricity through renewable energy means. This assurance came from Additional Chief Secretary Dr Tanveer A Qureshi, who is currently heading the provincial energy department as he spoke at a consultative session attended by managers and investors of wind energy projects in the province. One of the key problems being faced by investors keen to launch new wind energy projects in Sindh is the pending issue of leasing of the land in the Gharo-Jhimpir wind corridor of the province, and the government has the fullest resolve to solve the lease issue as early as possible in the best interest of the concerned investors. In this regard, the Board of Revenue of the Sindh government is soon going to convene a top-level meeting to resolve the land lease issue of prospective investors of wind energy projects, and the session would consider this issue as per the directives of the apex judiciary. The additional chief secretary for energy, speaking on the occasion, acknowledged that previously the government could not give equal emphasis to all the facets of the energy sector and issues of investors, including those willing to work on alternate power projects, lingered on. He said it was high time work on all these aspects of the power sector were done in tandem with each other in order to resolve all problems being faced by energy projects. He said that the problems being faced by wind energy projects like connectivity to the national grid would be sorted out at the earliest while engaging with the relevant federal entities and authorities. He said the government had a natural sort of monopoly in the power sector, but by no means should this monopoly be discriminatory against the interests of new power projects. the provinces took over several aspects of the energy sector. “But we should all keep in mind that energy is not at all a provincial issue as it is a national issue having a lot to do with the economy and the GDP so it has to be resolved through a national approach,” he said. He said that the provincial government would effectively plead before the federal entities the case of the concerned investors in Sindh so to facilitate them and to resolve their procedural and regulatory issues. “From now onwards the Energy Department of the Sindh government will adopt a proactive approach to resolve issues of renewable energy projects in the province as this include recommending to the chief minister the most relevant agenda points on behalf of the power sector to be discussed at the meetings of Council of Common Interests,” said the additional chief secretary. He said that best of efforts would be made so to provide the most conducive environment enabling the prospective investors to utilize ideal conditions in Sindh to produce electricity through renewable energy means. Engineer Mehfooz A Qazi, director Alternative Energy at Sindh Energy Department, also spoke on the occasion and informed the participants of the discussions about steps being taken to promote wind energy production in the province. Representatives of different wind energy projects in the province, including those in the planning and construction phase, informed the senior government officials about the different regulatory and bureaucratic hurdles, including connectivity to the national grid, they had been facing mainly from the federal entities owing to which they could not do their work in a desirable manner. 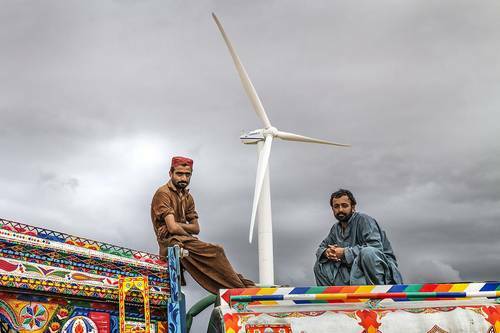 Owing to such persisting issues, deadlines to make the wind energy projects commercially operational and viable in the province could not be met, causing undue losses to the investors.